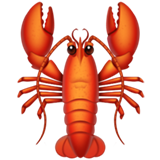 🦞 is an emoji depicting a lobster. It was introduced with Unicode 11.0 in 2018. 🦀 is an emoji featuring a crab shown from above. It was introduced with Unicode 8.0 in 2015.